Free Shipping Included! 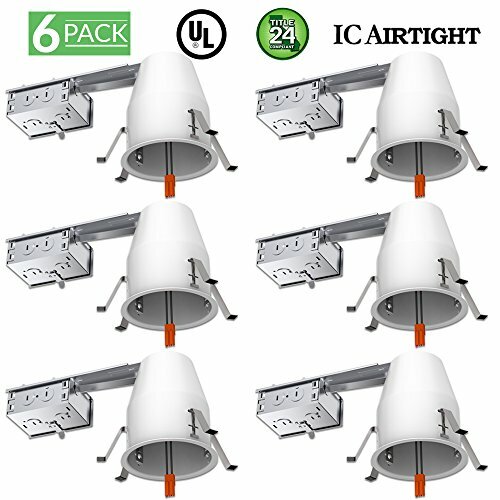 6 PACK - Remodel LED Can Air Tight IC Housing LED Recessed Lighting- UL Listed and Title 24 Certified (4 inch), TP24 by Sunco Lighting at Humble Opinion. MPN: SUN-4RM/IC. Hurry! Limited time offer. Offer valid only while supplies last. UL LSITED & T24 CERTIFICATION - The UL certification stamp is a sign of a better quality product. This product has gone through many tests before getting its approval which makes it the safest LED housing for your home and family. Because IC rated fixtures minimize moisture condensation, they reduce the need for electrician call outs and other repairs. Standard LED plug INCLUDED. EASY INSTALLATION - Fast, easy, and secure install with Quick Connect wiring connectors INCLUDED in junction box. AIR TIGHT & IC RATED - Give protection from overheating and fires caused by hot light fixtures. They are specifically rated and tested to be installed into ceilings with insulated roof space, and can safely be in direct contact with insulation.